2 Weeks of Pancakes and Green Beans! I have never been so ravenous in my life! You would think that competition prep would get easier the closer you get to the show! WRONG! You’re more hungry than you have ever been. You’re worn down, irritable, and you eat weird food combinations like pancakes and green beans! LoL! The Food Network is now my favorite channel and I have dreams about all the food I am going to eat after the show. What I do now is watch cooking shows and think about ways to make healthy figure competition friendly versions of these dishes. I have become very creative and will share my recipes with you! I just get so busy during the week, it’s hard to take time to sit down and write. After the show, I will have more time. Mix all of these ingredients together in a bowl until lumps disappear. Makes about 3 pancakes depending on desired size. You can also bake this mix in the oven and make an awesome brownie or put it in the microwave to make a quick brownie!! Place fresh whole green beans in a deep pan. Chop half of an onion and add in. Slice a cup of strawberries and add in. Boil the green beans until tender and season to taste. 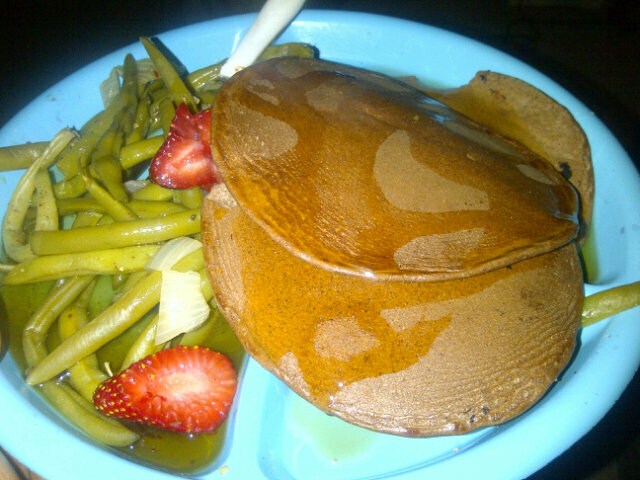 (The onion, chicken stock, and strawberries give the green beans more flavor..totally optional). The triple berry blend is available at Sam’s Club for around $8.00. You can get a very large bad and there is nothing added to it. Just plain, natural berries that are frozen. To make a syrup, take a little bit of the berries or preserves and place in a pan on the stove. Add in a little bit of water and heat until a syrup forms. You can add Splenda or Stevia to taste but I don’t think that is necessary.